In general, dental crowns candidates are individuals who have extensive tooth decay/damage, but sufficient remaining tooth structure in order to support the porcelain restoration. Dental crowns may also be placed during a smile makeover procedure. Individuals who are missing a tooth or do not have adequate remaining tooth structure should consider another solution. Dr. Champagne and the rest of the Champagne Smiles team realize that customizing crowns is one of the most important aspects for a successful porcelain crown procedure. They work meticulously to create crowns that look as natural as possible and blend seamlessly with patients’ natural teeth, for an overall stunning smile. Because of the high-quality materials from which they are crafted, crowns are incredibly strong and durable. They can last for many years with the proper care. They are also very attractive and are customized to blend in with the patient’s surrounding teeth. Receiving porcelain crowns at Champagne Smiles begins with a consultation to evaluate the extent of damage to the teeth and to create a personalized approach to treating the patient’s unique needs. A mold impression of the teeth is taken, which is later used to create customized porcelain crowns in Champagne Smiles’ state-of-the-art dental laboratory. After the crowns have been fabricated, the patient returns for the application. During the procedure, Champagne Smiles dentists gently apply the crowns using a strong adhesive. Champagne Smiles offers two of the most advanced porcelain crowns available: Lava and IPS Empress crowns. Lava crowns are metal-free restorations that use sophisticated CAD/CAM technologies to offer durability, comfort and fit. Unlike other crowns, Lava crowns have a zirconia framework that can be customized to match the specific color of a patient’s teeth. In addition, these crowns feature low thermal conductivity, which reduces the risk of tooth sensitivity. Champagne Smiles also offers IPS Empress crowns. These products have a track record of more than 15 years of patient satisfaction. 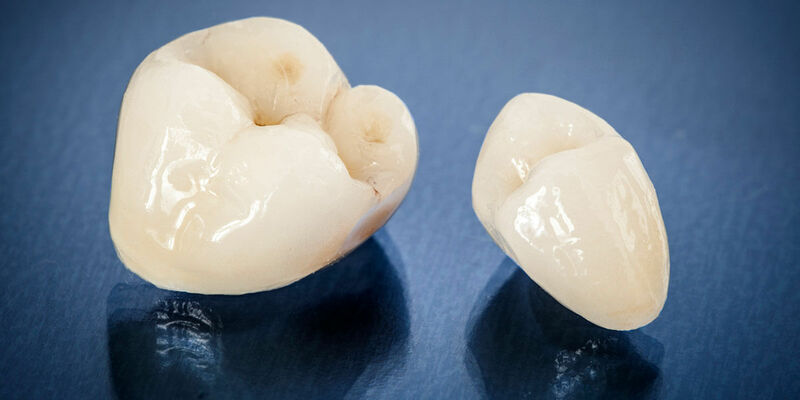 IPS Empress crowns are some of the strongest crowns available, and offer an excellent fit and natural-looking results. During the initial consultation, the Champagne Smiles dentists will explain the two types of crowns they offer in more detail, and will help patients determine which crown is best for their individual needs.